Volume 3, Number 2 of the first student newspaper on the CSUSM campus. The cover story reports on the academic year, increased tuition, and completed campus construction. 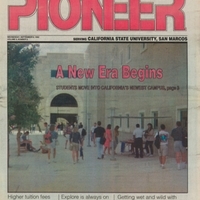 September 9, 1992,” University Archives at the CSUSM Library, accessed April 20, 2019, https://archives.csusm.edu/student-newspapers/record/49.